Srinagar, September 11 (Scoop News)-A delegation of Indian National Congress led by Sh. G.A. 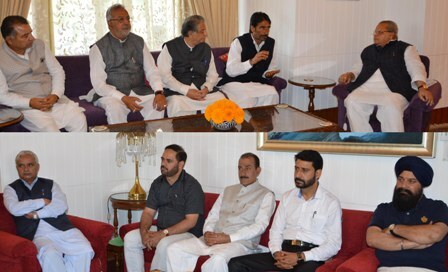 Mir, President J&K Pradesh Congress Committee, met Governor Satya Pal Malik at the Raj Bhavan here today. The delegation comprised Sh. Haji Abdul Rashid Dar, Sh. Ghulam Nabi Monga, Sh. Vaqar Rasool Wani, Sh. Gulzar Ahmad Wani, Sh. Mohd. Amin Bhat, Sh. Peerzada Mohammad Syed, Sh. Tariq Hamid Karra, Sh. Taj Mohi U din, Sh. Farooq Andrabi, Sh. Surinder Singh Channi, Mrs. KhemlataWakhloo, Sh. Abdul Gani Khan and Sh. Nissar Mundo.